An exodus from Austin to Northwest Arkansas gave Fayetteville’s Chuck Maxwell a chance to live his passion and make his mark on the Ozarks’ mountain biking scene. Among Chuck Maxwell’s favorite mountain biking trails is the Lake Loop Trail at Lincoln Lake, a 4.25-mile loop that offers access to large rock formations and remote wooded areas. Don’t try to tell Chuck Maxwell that there’s no such thing as love at first sight, because the 46-year-old transplanted Texan knows better. So began the long-running love affair between Northwest Arkansas and the Maxwells. The Texas natives moved from the concrete and oil fields of Houston where Chuck finished his post-baccalaureate work in perfusion. Fayetteville’s wild and unspoiled landscape — coupling interesting topography with miles of roads to explore — spoke to them both; he as a lifelong cyclist and she as a marathoner and triathlete. It wasn’t long before they’d found a circle of kindred spirits. Atop the dam at Lincoln Lake, Maxwell follows the Spillway Loop Trail at sunset. 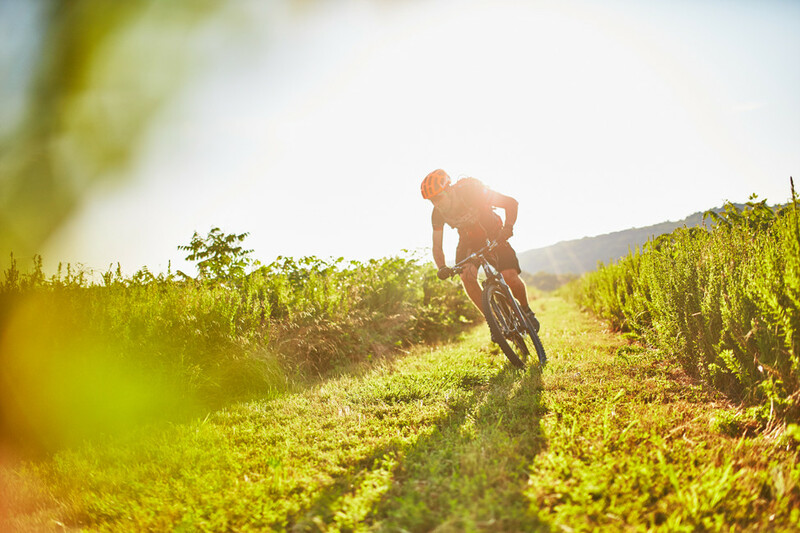 What Fayetteville and the surrounding communities did not have at that time was a well-developed set of trails, particularly to accommodate the emerging mountain biking segment of the cycling population. “Before the 1980s there were no mountain bikes, cycling was virtually all done on the roads and then gravel roads,” Chuck says. 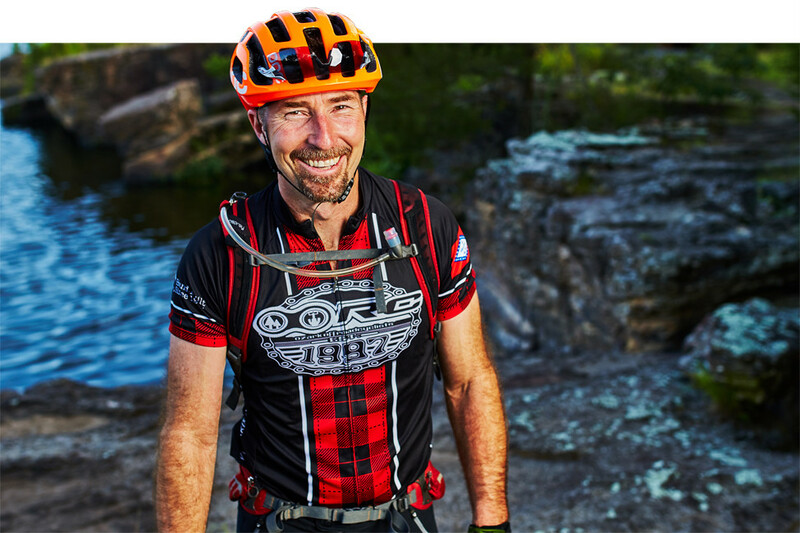 Ozark Off Road Cyclists, a chapter of the International Mountain Biking Association, formed for just this purpose, a group Chuck not only joined but has helped lead as its president. Throughout its history, the OORC and its members has helped advocate and develop local trails, promote the sport through group rides and sponsor competitive events as part of the Arkansas Mountain Bike Championship Series. But the group’s most enduring contribution has been building more than 100 miles of mountain bike trails throughout the region. Over the years, the group’s members have become experts in designing and constructing trails that keep one eye on the sport and one on conservation. This grassroots effort has come a long way over the years. The work that has been accomplished has lent considerably to the quality of life in this part of Arkansas, a lifestyle that has revolved around and long revered the outdoors. 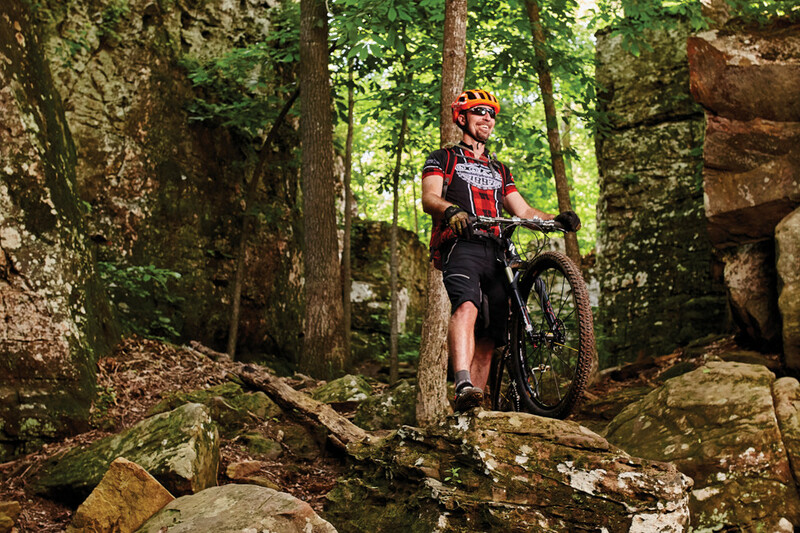 Today, the trails in Northwest Arkansas represent some of the best riding in the country. Particularly noteworthy are routes at Black Bass Lake and Lake Leatherwood in nearby Eureka Springs, Devil’s Den State Park and Mt. Kessler in Fayetteville, Hobbs State Park in Rogers and Slaughter Pen in Bentonville. Perhaps the most conspicuous testament to the active, outdoor culture of Northwest Arkansas is the Razorback Regional Greenway. Completed in 2015 at a cost of about $38 million, the project is comprised of 36 miles of primarily off-road, shared-use trails extending from Bella Vista at the Missouri state line south to Fayetteville. 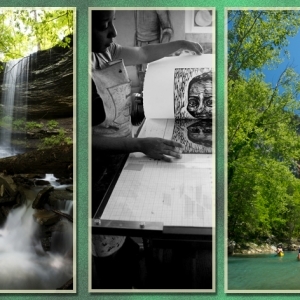 Along the way, six communities and dozens of popular attractions are linked including the University of Arkansas, shopping areas, historic sites and neighborhoods. The trail has also brought economic development to the communities it connects; all along the Greenway, you can find local restaurants, shops and a growing number of microbreweries and populations as diverse as the geography. Hop off the trail in Fayetteville after a run for a hand-crafted brew at Columbus House or Fossil Cove breweries, or cycle up an appetite for one of Pedalers Pub’s wood-fired pizzas in Bentonville. It’s an eclectic scene Chuck compares to the Austin of his youth. The Razorback Regional Greenway project, funded primarily through grants by the Walton Family Foundation and the U.S. Department of Transportation, is also the capstone on this growing area’s reputation for excellent outdoor amenities that is gaining nationwide attention. Chuck touts the diversity of mountain biking trails in Northwest Arkansas. “You’ve got everything from the Railyard in Rogers to jump-oriented parks,” he says. Green House Grill "Local fare, a lot of farm to table. I like their shiitake quinoa stir fry." Kona "Our new Indian restaurant. I really like the vibe here." Square 2 Square Bike Ride "Covers Springdale, Fayetteville and goes into Bentonville. Pretty fabulous." 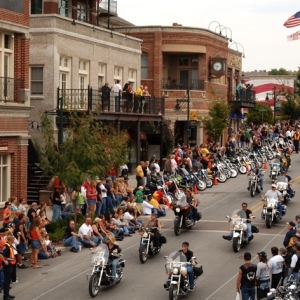 Bikes Blues & BBQ "We get a huge crowd of visitors through here. Lots to see and do." Springfest "We've added music to this event to make it more of a street festival to go along with the local vendors." Chile Pepper Run "Always been a favorite off-road course. Just beautiful." (30 minutes north) "The Walton family's legacy looms large here, including the outstanding Crystal Bridges Museum and Walmart Museum on the town square." (30 minutes north) "Catch a concert at Arkansas Music Pavilion or a foul ball at a Northwest Arkansas Naturals baseball game." (1 hour northeast) "A place like no other. Eclectic shops, interesting people—the entire cliff-hugging downtown is on the National Register of Historic Places." 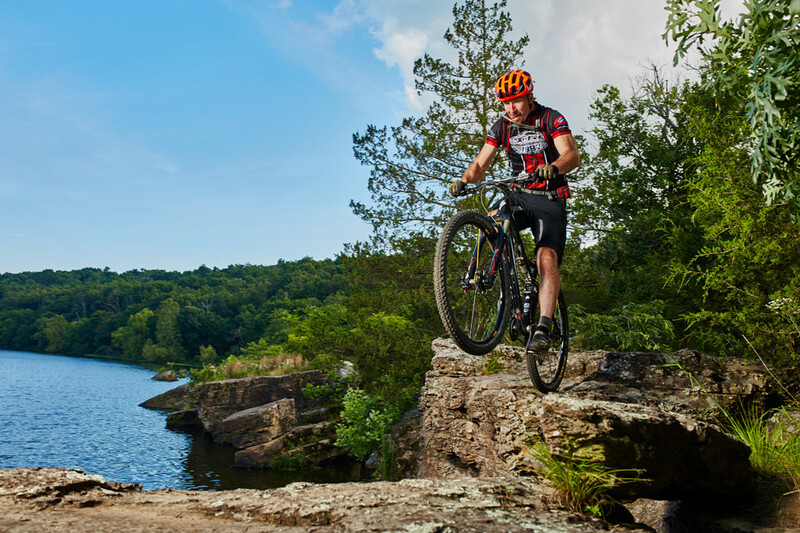 Find a happy trail of your own at Great Mountain Biking/Cycling Trails to Explore in Every Region of Arkansas.